As you might know, AMD has managed to remain the leader in graphic chipsets, but Intel still holds both the mobile and hybrid computing markets. This is where the Accelerated Processing Unit (APU) comes in to play for it is a combination of CPU and GPU all rolled into one. It is AMD’s response to Intel’s SandyBridge and referred to as ‘Llano’. The AMD A6-3650 is the budget-friendly little brother to the AMD A8-3850 we did a review on last month. This APU by AMD retails for $119.99 on TigerDirect, which is $20.00 cheaper than its slightly bigger brother. The A6-3650 has a 2.6 GHz quad-core CPU, 443 Mhz GPU with 320 Radeon HD cores, 4 MB of L2 cache, and a 100W TDP compared to the A8-3850 2.9 GHz quad-core CPU, 600 MHz GPU with 400 Radeon HD cores, 4 MB L2 cache, and a 100W TDP. The difference may not be much, but it will mean this processor is not as fast. Either way this will be an enlightening review. The ‘Llano’ APU platforms by AMD have the ability to dynamically use Radeon cores for either computing or graphics dependent upon the tasks being run. This means efficient switching between GPU and CPU usage, which in turn means better performance. Additionally, ‘Llano’ supports DirectX11 with DirectCompute, HD-3D, AMD-Vision engine, UVD3, and OpenCL Acceleration. AMD’s flagship motherboard chipset, the A75, will offer native Superspeed USB 3.0 and SATA 3.0. For this review we will be using ASRock’s A75 Extreme6 motherboard. Currently AMD has 2 ‘Llano’ APU’s: the A8-3850 and the A6-3650. Both of these are 100w Quad-core solutions. 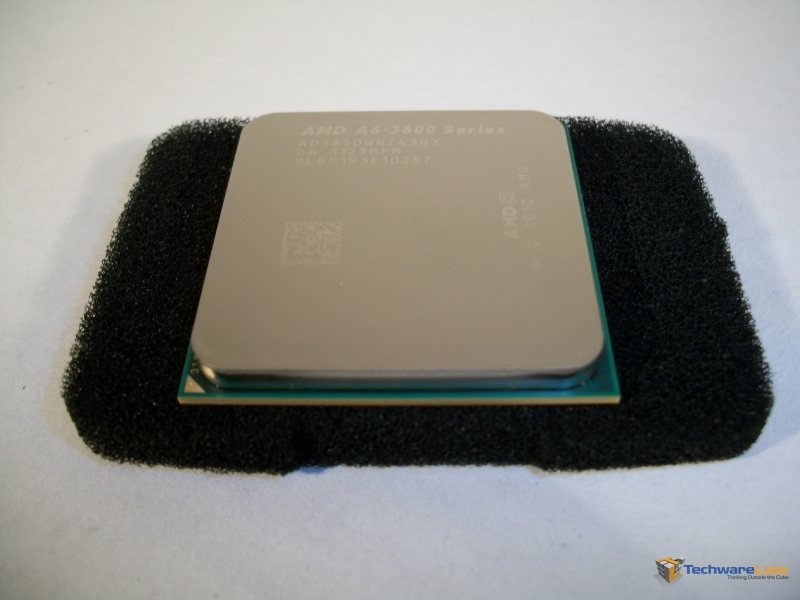 The AMD A8-3850 APU has the AMD Radeon HD 6550D GPU inside with 400 Radeon cores and a clock speed of 600MHz. The Radeon HD 6550D is capable of reaching 480 Giga Floating-point Operations per Second (GFLOPS) of GPU peak compute. The AMD A6-3650 APU has the Radeon HD 6530D GPU inside with 320 Radeon cores and a clock speed of 443MHz. The Radeon HD 6530 is capable of reaching 284 GFLOPS of GPU compute power. When it comes to potential peak GPU computing power the AMD A8-3850 has 59% more GFLOPS than the A6-3650 for an additional investment of only $20 at the time of purchase. If you care about GPU performance it might behoove you to pay that little bit extra for it; however, I would still recommend sticking around for the Test Rig results as the difference may not be as big as it seems.